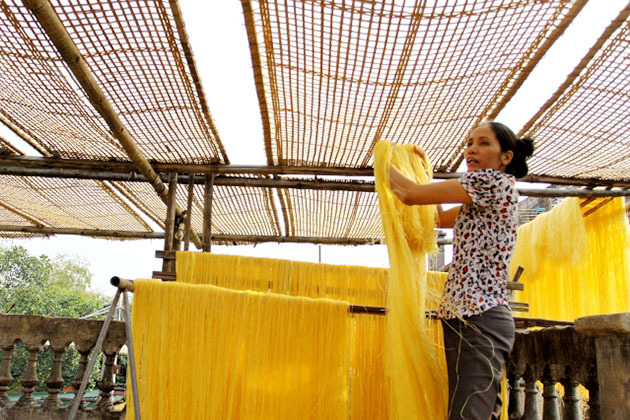 Cu Da ancient village is not only renowned as a unique cultural place, which still retains a series of Vietnamese antique style buildings but also a well-known place for its largest vermicelli production in the North Delta. The village is recognizable for the age-old houses which were built during the French colonial period with the impressive architecture. Follow the guide below and explore its highlights! 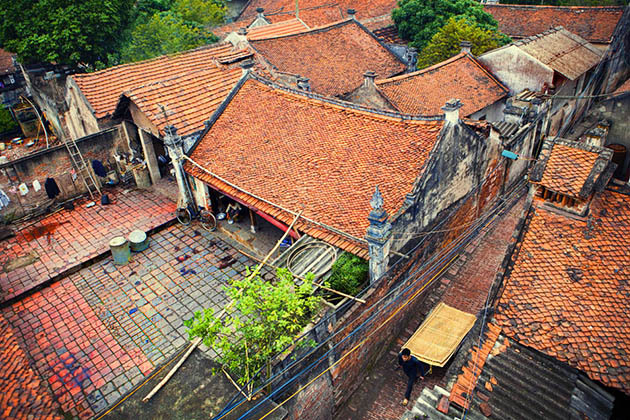 Besides the vermicelli production, Cu Da is also home to an interesting mix of architecture including traditional housing, tube houses, French influences, and modern houses. Additionally, Cu Da Pagoda – national relic is indispensable place in your trip, it’s exactly a famous not only as a sacred destination but also as the attractive & well-kept complex with a series of interesting buildings dotted here and there. I also found that Cu Da village has many other ancient things to explore such as the communal village house, family temples, public well and hamlet gates. One more another thing that impressed me a lot is the friendly local people, they may be the types of out-of-centre locations. Houses in Cu Da Ancient Village are low and deep in length, thus they are usually cool in summer and warm in winter. Most of the architecture in the village are specified in Nguyen feudalist dynasty, they were made of wood. There stand myriad of delicate sculptures on beams and the pillars. In the middle of the house, there are always the ancestor altars, panels, and parallel scrolls. Honestly, your trip will be easier if you have a good guide who can not only show you, introduce everything to you but talk more about the Vietnamese culture and also the culture of Cu Da Vermicelli village. My trip was successful when I traveled with a local guide from Hanoi Local Tour, one of the best travel operator I have ever known. Not for PR or other individual aims, you should have a local guide as well as get in touch good local private tours. I’m sure that it’s not disappointed when you visit Cu Da ancient village and see directly how they make the traditional vermicelli. Ancient place in the rural countryside, I found Cu Da Vermicelli an interesting and friendly spot. 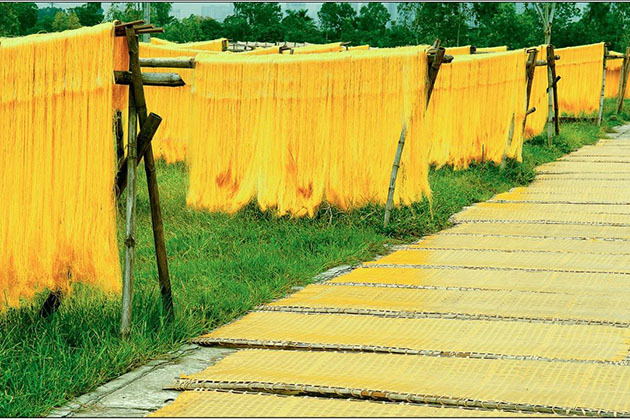 Together with the antique constructions, Cu Da Ancient village keeps the traditions of making vermicelli. Vermicelli noodles or Mien in Vietnamese come in white and yellow versions, you can see it in the noodle soup or in spring rolls which all the popular dishes in Vietnam. But do you know how to make the product of vermicelli? Follow us to find out the secret! 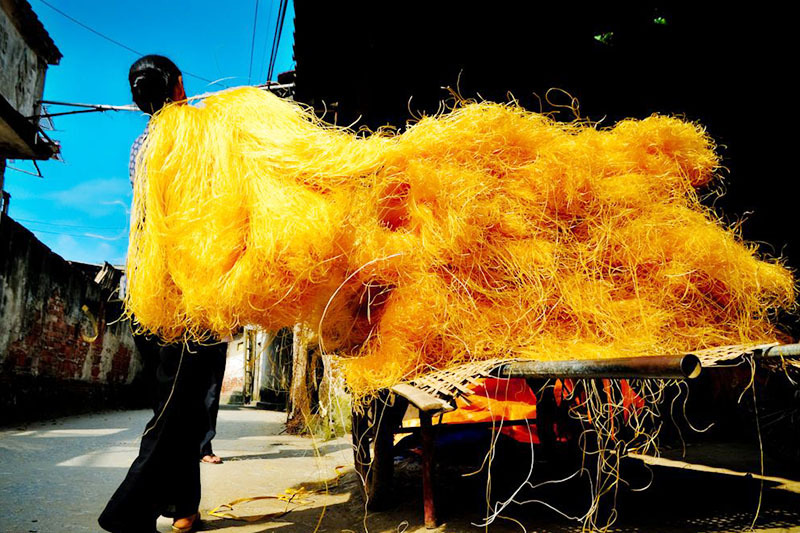 Both the white and yellow versions of vermicelli are made with arrowroot which is ground and mixed with water to make a paste, then it is spread onto large bamboo trays to dry. It will be cut into thin strips (called vermicelli) and dried again before packaging. Although people now have used modern machines, people in Cu Da Village still make vermicelli by hands which uses a very labor intensive process. And from generation to generation, vermicelli production is maintained and it becomes the main income of the villagers. If you have any plan to visit Cu Da village, this part telling about Cu Da location and how to get the Village is definitely useful for you. 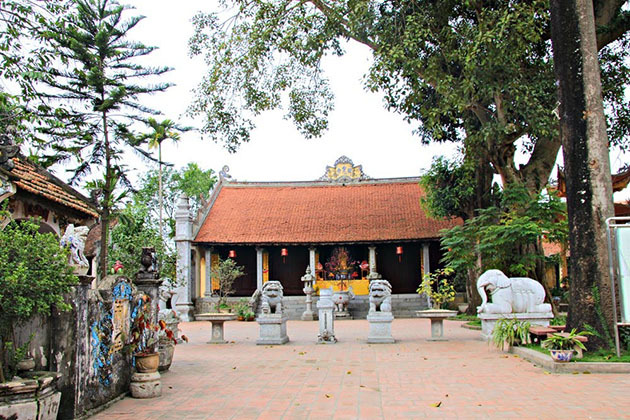 Cu Da ancient village was in original Ha Tay province, but now it becomes a part of ever-expanding Hanoi. From Hanoi, it takes about 1h30 to get to the village. There stands a small notice when you find information, the area has changed notably in the past 10 years, in details, the urbanization has made it more of an outskirt than a village.